Here's a sneak peak of our Christmas card. This was the first year that I can remember Haldan and the children playing such an active role in the card process. Everyone had their task. 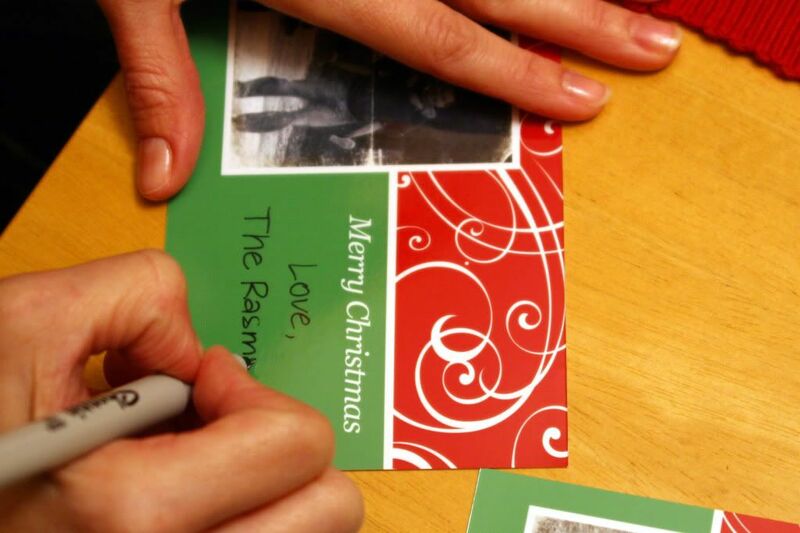 I made the cards and signed them and helped adhere the letter to the backs. (Had I been a little more technologically savvy I would have had our names printed on the cards, but this makes it a little more personal.) Haldan was in charge of writing the letter this year, cutting them, and printing address labels. Pokey did a mighty fine job of gluing the letters to the back of cards and Little Man stuffed. We were a fine oiled machine. It was nice to have such a great team. I'm hoping we can finish up the loose ends and get them out early this week. I had originally designed 2 different cards. Below is one of them. It was going to be a tri-fold (if you can invision) with the text either over the larger picture (with pic in a lighter opacity) or on the back. I also made another one that I decided to make into my year in review scrapbook page instead. You'll have to wait to see that one. After I tallied the cost of ink, paper, and envelopes... the free unoriginal cards prevailed! I'm sure you're cards will be great. I do LOVE that one you posted though. I managed to make a decent one of the free ones. They should be arriving soon then will be out!! Hopefully they look good in person. You can't quite tell online. Looking forward to getting yours! !